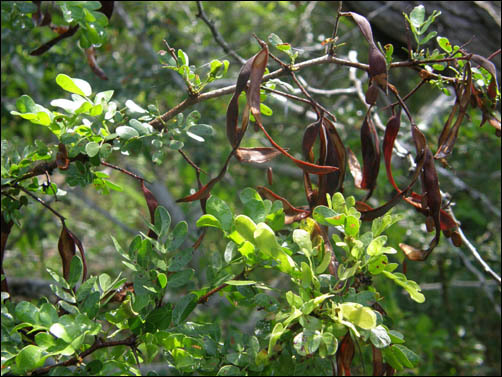 Blackbrush Acacia (Vachellia rigidula), overview, flowers, foliage and seed pods. Photographs by Wynn Anderson. Geographic Range: South Texas and adjacent Tamaulipas, northwest along the plains of the Rio Grande corridor into southeastern Trans-Pecos and south through Coahuila, Nuevo León to San Luis Potosí and Veracruz. 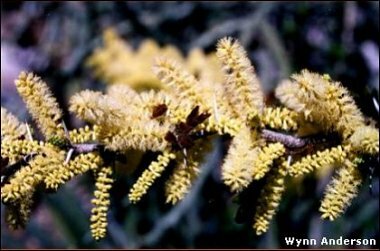 Description: Shrub or, occasionally, a small tree, 3' to 15' H by 3' to 12' W with fragrant, pale yellow, cylindrical flower spikes in the spring before leaves fully appear; multi-stemmed, thorny, thicket-forming shrub; dense, dark green foliage with stiff thorns on rigid branches. Landscape Use: Sometimes commercially available, mostly for erosion control. 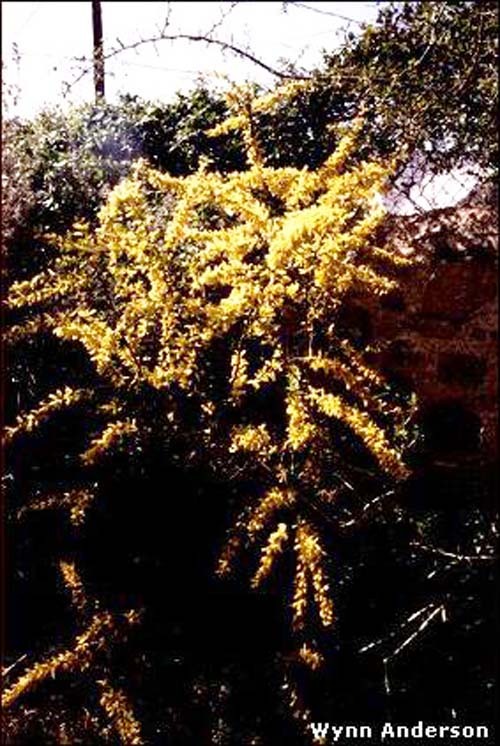 The stiff vicious thorns make the plant an effective barrier hedge plant, and the fragrant flowers provide excellent honey. It is slow growing, needs good drainage, tolerates a wide range of soils; low water and full sun, hardy to 20°. Notes: Formerly known as Acacia rigidula.